Santa … a powerful parental tool for more than 100 years! I recently completed working on the Harold Dies papers and they are almost entirely related to Theodore Dreiser’s literary estate and the Dreiser Trust. However, as is the case with many archival collections, I found a few unexpected treasures buried inside envelopes and tucked into folders. The Dreiser and Dies family trees rival the Biddles when it comes to complexity. Lots of cousins, lots of siblings, lots of complications. But this little story below has to do with Theodore Dreiser’s brother Paul Dresser, his sister Emma, and Emma’s two children, George and Gertrude. Paul Dresser was a singer, songwriter, and actor, in addition to a well-intentioned uncle. 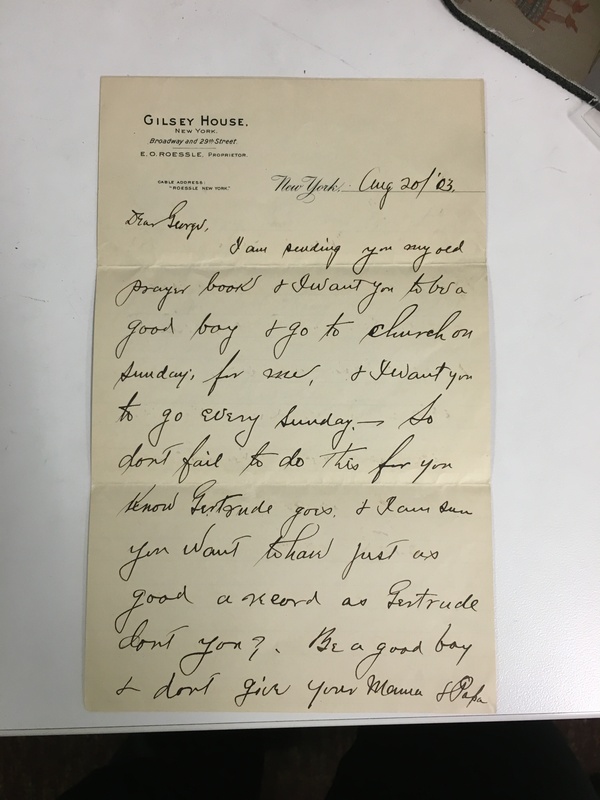 It appears that his nephew, George, was a bit on the naughty side … there are several letters written in which Uncle Paul instructs George on good behavior, which includes going to church (EVERY Sunday) and not giving his parents trouble. It appears that George didn’t listen to Uncle Paul, so, as December rolled around, Uncle Paul did what so many adults faced with naughty kids do: he threatened him with … SANTA CLAUS. Who knew that was a thing as far back as 1903? The letter ends with a note: “Tell Geo. to behave or Santa will make trouble. I love this … usually Santa punishes passive aggressively by not bringing gifts, but here … he is going to make trouble! There is no evidence as to whether Uncle Paul’s threats worked and George decided to be good until December 25. 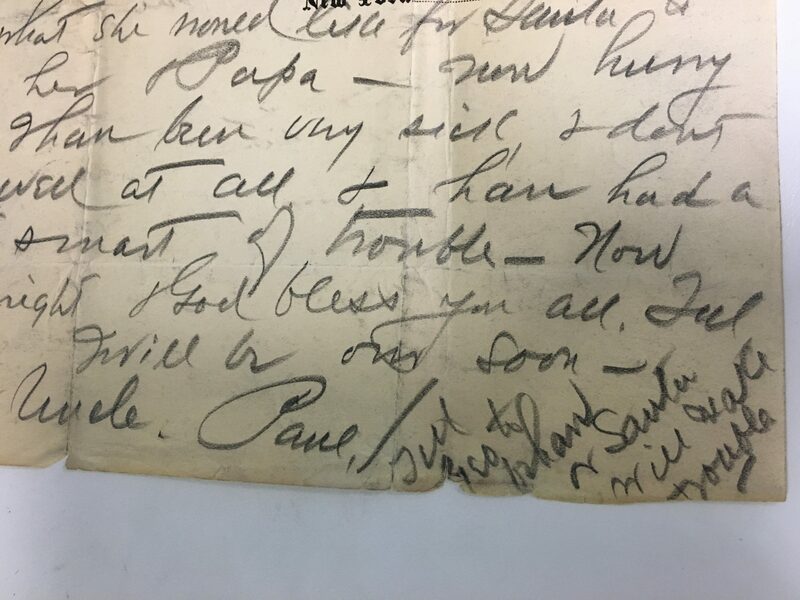 Sadly for George and Gertrude (and his sister, Emma, to whom he wrote a number of encouraging as well as instructive letters about the children’s behavior), Paul died only three years later and was not around to keep all of them on their toes. 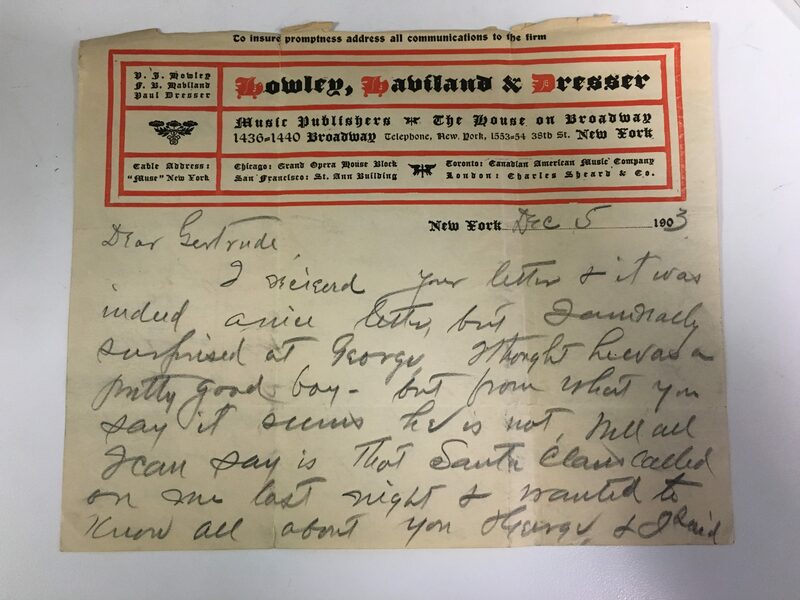 Despite the humor of the contents of these letters, it is easy to see the family’s dynamics, even in just a few pencil-scrawled words. Paul was Emma’s older brother by six years and his protectiveness of her is evident in every single letter … the message to her kids is that they should always treat her well and make life as easy as possible for her. His message to his sister is that she should make the kids treat her well and do their part to make her life easier. The letters are lovely reminders of how family members look out for each other … and how they use any tools at hand to promote their cause. This entry was posted in Manuscripts by Holly Mengel. Bookmark the permalink.